Organizations, private sector firms, government agencies and international bodies are invited to become supporting partners in hosting the Conference on Ecological and Ecosystem Restoration (CEER 2014). 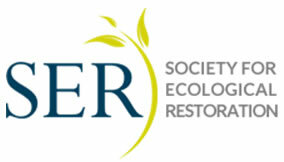 CEER is a collaborative effort of the leaders of the National Conference on Ecosystem Restoration (NCER) and the Society for Ecological Restoration (SER). It will bring together a diverse international and national audience of ecological and ecosystem restoration scientists and practitioners to address challenges and share information about restoration projects, programs, and research from across North America. • Exclusive sponsorship of an evening poster session reception. • Grand prize drawing entries collected at your booth to generate traffic. • Brochure insertion in attendee tote. • 1/2 page exclusive recognition in printed program book. • 1/4 page exclusive recognition in printed program book. All organizations contributing at the SILVER level or higher will receive special recognition and visibility. As a valued sponsor. . .
• You will be invited to a private reception as an opportunity to network with plenary speakers, dignitaries and restoration colleagues. • You will have an opportunity to moderate a session, if you so choose. • Your organization’s logo will appear in all publicity announcements sent to more than 15,000 restoration professionals from around the world. • Your organization’s logo will appear on the conference website and in the Abstract Book. • We will include your logo on sponsor recognition PowerPoint slides shown through the conference. • Your logo will appear on the entrance units placed outside the Plenary Session & Exhibit Hall. • Your logo will appear on the back cover of the printed Program Book and on conference signage. 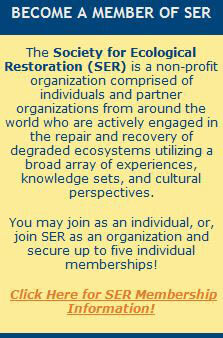 • Your organization will be recognized in a post-conference issue of the Society for Ecological Restoration (SER) newsletter. • Two weeks prior to the conference, you will receive the list of attendees in Excel and a final update after the conference concludes. the sooner you start generating visibility! If you wish, you may make a general financial contribution to support the conference. FRIENDS will be recognized on the conference website, in the printed Program Book and on sponsor recognition Power Point slides at the conference. Contributors of $500 or more will receive a complimentary table top display. Simply indicate the amount of your donation when completing the Sponsorship Commitment Form. THANK YOU FOR YOUR SUPPORT! Support the Monday, July 28 CEER 2014 Make a Difference Event. We are developing a project where CEER volunteers will work together and Make a Difference to enhance an environmentally sensitive region in the New Orleans area. If you or your organization wish to make a charitable contribution in support of this event, please indicate the dollar amount of your tax-deductible donation on the sponsorship commitment form. This donation can be in addition to your general conference sponsorship, and all Make a Difference contributors of $500 or more will be recognized in the printed program and on the conference web site, and, your logo will appear on the back of the volunteer t-shirt. To lock in your sponsorship, CLICK HERE to fill out an ONLINE Sponsorship Commitment Form. Simply fill out the form, indicate your sponsorship preference and continue advancing to the next screen until you arrive at payment instructions. You can conveniently pay by credit card OR check using the online form. PRINT A COPY of your sponsorship confirmation once you have completed the online process. You will also receive a copy of the confirmation form by email. Please keep this on file for future reference. IMPORTANT NOTE: Upon receipt of your sponsorship payment, we will contact you to finalize remaining details of your participation as a sponsor, including confirmation of a booth assignment and instructions on how to use your complimentary registrations. Sponsorships will be confirmed on a first-come, first-served basis after payment is received. Payment must be received by June 16, 2014 to be recognized in print. CLICK HERE to print a hard copy of the CEER 2014 Sponsorship Opportunities. If you have questions about CEER 2014 and want to know more about how your organization can get involved as an active partner, contact Beth Miller-Tipton at: bmt@ufl.edu or by phone at 352-392-5930.